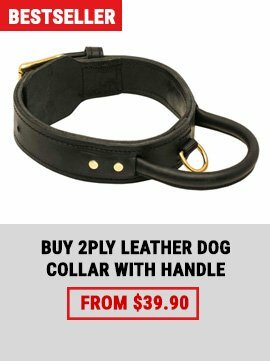 A collar is a necessary device for every dog owner. We are proud to offer high quality collars in our Training Equipment Online Store for German Shepherds. Special instructions and photos will help you to choose the needed model for your pet. If you make a right decision, your dog will feel comfortable on a walk. In our store all the collars have a quality certificate, so they are safe for the health of your dog.We offer collars of various models and colors. Every dog must have a collar, but it's not so easy to choose the right one. Special ammunition is produced not only according to the breed of the dog, but to different situations and types of training. To find out a needed tool among the variety represented in modern zoo industry is difficult enough. We will help you to make a right choice and to dress up your German-Shepherd dog in a suitable accessory. 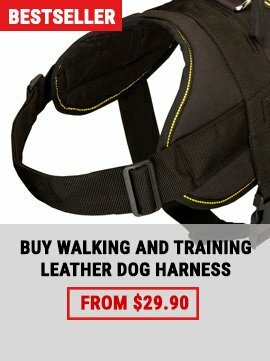 Soft classic (for walking, with a handle for guarding service) collars are made of leather, or it may be a synthetic nylon collars or a combination of two materials. Usually these supplies have a soft padding (soft thick felt padded collars, fleece, or Nappa padded ones) to create a comfort for your dog. Collars for walking are the most popular models. As a rule such collars have one D-ring for attaching a leash. 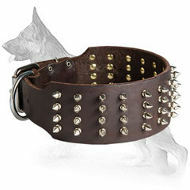 It can be situated near a buckle that doesn't prevent your pet to move his head. Also this D-ring can be on the opposite side of the collar, in this case the dog owner doesn't have to look for this ring (a buckle, as the heaviest part, is hanging on the dog's neck). Protection training collar is equipped with a convenient handle for holding a dog. A ring for a collar is on the handle or under it. Usually there is one more D-ring near the buckle, and during training work it is better to attach a leash to this buckle. Guard collar is the most reliable and time-tested model. 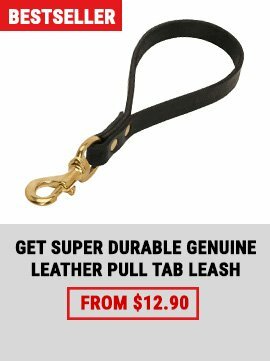 The purpose of its use is to keep a dog on a leash constantly, that's why this tool must be of the best quality and durable. The main characteristic of guard collar is that the strap of the collar goes firstly through the D-ring and only than fastens to a buckle. In this case the impact force is directed not on the buckle and holes for fastening but on dense material passed through the ring. 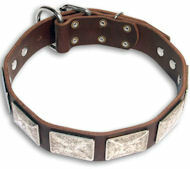 The buckle is situated on the top of the collar and it doesn't interfere with the dog. 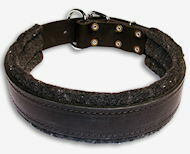 Choke collar (metal chain, leather, synthetic) is usually used for trainings and dog shows. But a little weight makes them practical for everyday application. A dog perceives the choking effect of these collars as the closest to natural education in a pack: a dog-mother teaches her puppy by strangling his neck. However any effect like this, especially applied to a puppy, must be precise and short-term, otherwise an educational purpose can be lost. An experienced trainer before permiting a beginner to use this supply should give detailed instructions about its application to a dog. What material is more durable? 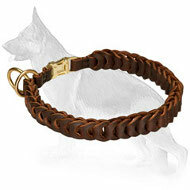 The collars are made of resistant leather, synthetic sling or cord, metal, and their combinations. Leather is more pleasant material both for people and for animals. High quality dense leather will always be beautiful and trendy, besides it will serve for a long time. But as every leather product a collar requires careful attitude and special care. Synthetic materials are considered as the most durable ones for the production of soft collar. Resistance to the external influences and different weather conditions makes nylon collars indispensable in everyday life. 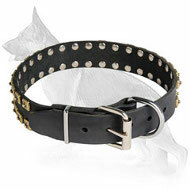 Besides a dog owner can select a color, width and model of the collar according to his taste. 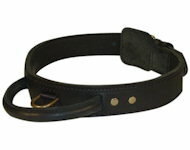 The most durable and reliable collar is made of the combination of leather and synthetic strap. If the collar is properly produced and has reliable fittings, it will be the best variant for guard dogs and training of big dogs to protect. It's clear that the high quality metal collars can serve for several dogs' generations. But this tool isn't appropriate for cold season, because it is possible a dog to get frostbite. You can make a collar for your pet by yourself. But note that safety of your dog and people around depends on its reliability. That's why take into consideration your German-Shepherd dog's size and force, choose materials and supplies in the way that their tensile strength will be at least 5 times higher than the weight of your pet.